The “final push” begins! Well so the advertising from Newcastle Falcons for our upcoming final round league game at Kingston Park informs us, and rightly so, as at 4pm this Saturday 5th May the battle will commence on who will travel where come semi final play off time. Will it be the South West of England to Sandy Park? Or the North West(ish) of London to Allianz Park. Hardly a prize that will have you reaching into your wallets to purchase strips of raffle tickets to try to claim one or the other, more Hobsons choice without the option of leaving it. Make no bones about it, this is like choosing between a rock and a hard place. Both Chiefs and Sarries are tough enough opponents even when crossing swords on your own cabbage patch, let alone having to travel to each other’s respective castles, and trust me with Sarries enjoying an 80% home success rate and Chiefs a 91% win record these are sets of barricades devilishly hard to knock down! But here is where the devil is in the detail, Worcester’s Warriors stormed the Devonians ramparts, and the fez heads have had to reluctantly allow Leicester’s Tigers and those marauding Chiefs hoist their flags above their mighty battlements. Fortresses are made to be conquered, legions overwhelmed and dynasty’s ended, form will play its part, but knock out rugby is deliciously open ended, thus no matter the odds there is always the chance that armies of Falcons and Wasps will fill HQ rather than hoards of tomahawk choppers or groups of those in black and red singing right said Fred. But these are thoughts for the future, for an article that must be penned in 14 days’ time. Focus must be drawn backwards, to the hear and now, to the windy stadium in the North East, the weather can be inclement and sometimes downright cold, yet the welcome always warm. However, come kick off 30 starters, 16 replacements and 2 coaching teams will be straining every sinew to get that most important of confidence enhancing wins heading into the play offs. Kingston Park is a tough place to get a win, especially against this Falcons team and gritty, passionate performances that Dean Richards class of 2017/2018 are putting in. 70% home win rates are hard earnt, especially when you consider that this was a club battling to return to the Premiership only 5 seasons ago. It is well researched that going from Championship to Premiership is a tough jump, so even though it was a one season sojourn, it should not play down nor dilute the hard work, commitment and financial investment put into this club, which now sees them vying for the title they have held themselves back in those wonderful loose fitting, cotton made rugby shirt days. The last 11 league meetings between us and Falcons sees a rather positive 8 wins to us, 1 draw and 2 losses, with that last loss occurring at Adams Park in round 22 during the last knockings of the 2011/2012 season. Remember that? I certainly do, a home loss of 10-14 to the very same team that was scrambling for all their worth to avoid the trap door to the Championship. However, thanks to Tom Varndells wonderful tackle against the prematurely celebrating Sam Vesty in the previous rounds game against Bath at the Rec, thus saving that vital, season defining, club surviving losing bonus point the fabric and narrative of this final round game was favourably changed towards our survival. Thus 33 points was enough to better Newcastles 32. I honestly believe that of the two clubs at that time Newcastle were able to survive a season in the Championship, however I am not sure the sink or swim test would have been quite so successful for a Club that only had a £60 float. People will always ask whether we would of survived, however when your director of rugby is paying for the tape to keep the teams lifeboat afloat, a year in the choppy waters of tier 2 rugby may well of torn us asunder. That is why Varndells lifeline has turned this little rowing boat into a rapidly developing cruise liner. Yet how we would love to see the older silver wear that adorns its decks grow though, maybe something new, something shiny and adorned with black and gold ribbon, a 2018 update? 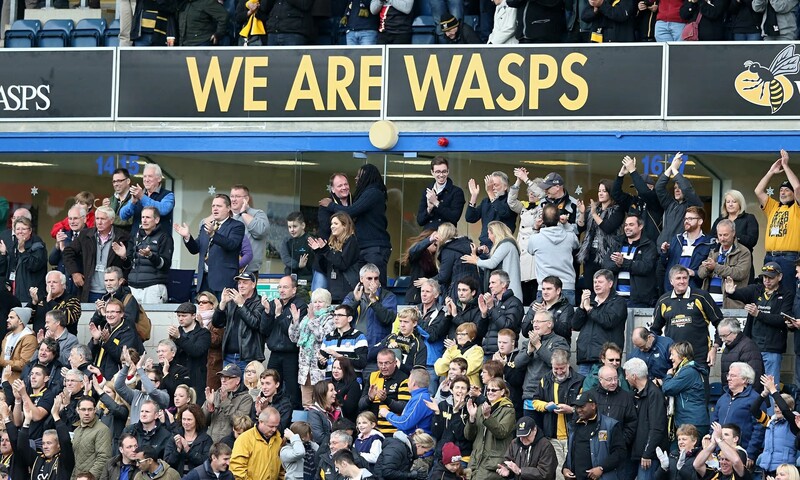 Yet to get there we must defeat the Falcons, and certainly our 40-10 win at our Ricoh home, our “Wasps nest” – well I like the sound of this – was a convincing score. 6 tries with scores from Hughes, Eastmond, Bassett, Gabi and a brace from Wade against a lone try from Robinson made for a celebratory afternoon in Coventry. Will this mean we should look to another similar result like this? I would postulate not, those lovely well trotted out statistics paint a rather different hue and provide a conclusion that can only be that this game will be banjo string tight. Falcons average 25 points a game to our 27, 3 tries to our 3-4, win 6 turnovers on average to our 7, have 124 carries to our 124 and make around 151 tackles to our 140, whilst conceding 10 penalties to our 9. These are not the averages to place one team nor the other firmly into the pre-game favourites camp more into the “who the heck can say” club. Injuries of course will play their part, Newcastle’s first 2 front line fly halves are crocked with Toby Flood and Joel Hodgsen in the nurse’s office, can third or fourth Matavesi or Craig Willis step in? However, in the dangerous Goneva, illusive Hammersley, rapid and busy legged Sinoti Sinoti, old head Lawson, and coupled with the nous of match winning, try scoring Ally Hogg led by the North Easts le petit general in Young Newcastle have a team that can win. The test for us will be if Garrett, Myall or Rowlands can ensure that adequate horse power is maintained in the engine room of the second row should Stallion Launchbury be rested? Can Ben Harris step into Simon Mcintyres pectoraly stretched shirt? Will Daly continue the wing, or will the more than capable and talented Bassett step in for him or Wade as the squad rotates? Can Tommy Taylor keep gaining that vital match fitness, or do we start with the impressive Cruise? Permutations abound, and match ups will be made when the teams are announced. If I was a gambling man, which I am not, I get an unhealthy sweat on putting in a quid for the works Grand National sweepstake, I would say holster those wallets, look after those Queen Elizabeth’s, they are safer where they are. Yet let’s enjoy what should be a fierce encounter, a match full of passion and commitment, and wherever our paths may lead after the final whistle, let us hope that it meets again on a sunny day in Twickenham! And remember…. Brilliant - as an accountant, not a turf accountant, I get the shivers placing a bet too! It would be a result for rugby for Wasps and Falcons to end up at HQ as it would show that the overall standards are improving? I think we might sneak tomorrow, I'd love to see us beat Sarries away....I think that is more likely than in Exeter, but who knows these days? Brilliantly written. I agree. I’ll be keeping my fiver dry, but might fancy a wager on us reaching the final. I’m not that confident Kent! Your efforts in keeping the board up are greatly appreciated. The fact you articles are decent is a bonus! 2 hours to go, nice and hot here, great beer, should be a good one.